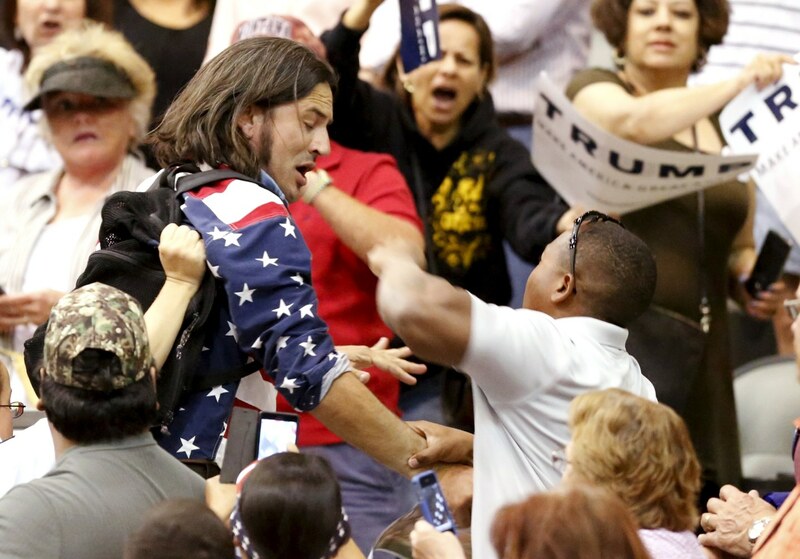 A Donald Trump rally punctuated by near-constant interruptions from demonstrators reached a violent crescendo Saturday when a protester was punched and kicked while being escorted out. 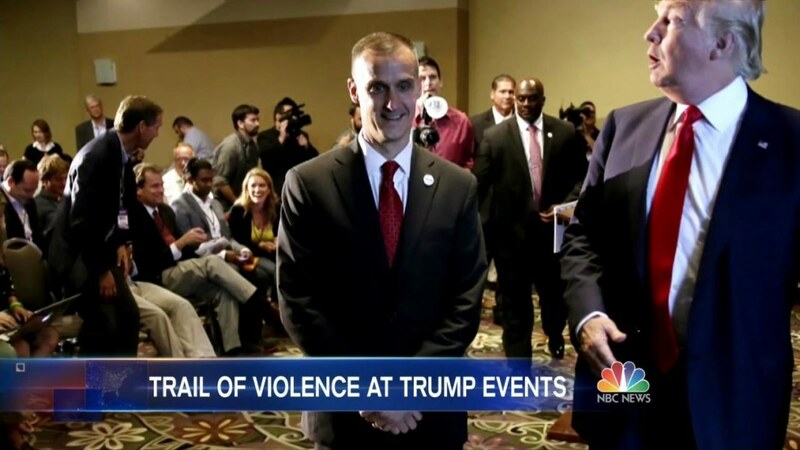 The incident at the event in Tucson, Arizona, was the latest in a series involving scenes of violence at and around events for the Republican front-runner. There were around 150 police officers working at the Trump event in Tucson on Saturday night. Trump was interrupted several times during the first 20 minutes or so of the rally by protesters, who the candidate called "disgusting," "troublemakers" and a "disgrace." Bryan Sanders was one of the protesters — dressed in an American flag shirt and holding a sign with Trump's face with the slogan "Bad for America." 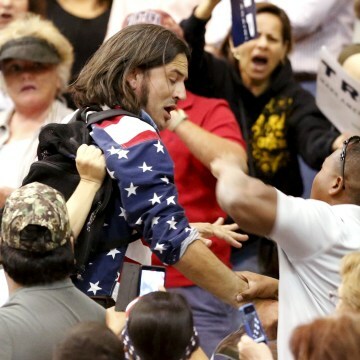 He told NBC News that he was being escorted out of the rally when a man in the stands grabbed his sign and ripped it out of his hands. "I stumble back, sucker punch.. and then you saw all hell break loose," Sanders said. "He's stomping me." Video emerged of the incident that shows Sanders being punched and kicked on the ground before police are able to separate the two men. "What was going through my mind was: Put your arms over your head, because this political movement has gotten to the point where you may get beat to death inside of a rally," Sanders said of the moments he was on the ground. Officers arrested Tony Pettway, 32, at the scene. He was charged him with assault with injury, a class 1 misdemeanor, and released, police said. Trump noticed the disturbance during his remarks, pointing to the stands and saying, "That's a disgrace." It's unclear if Trump was referring to the protesters or the violence. "They're taking away our First Amendment rights. They're troublemakers, they're no good, and we have to be careful," Trump said. "We've gotta take our country back, folks. 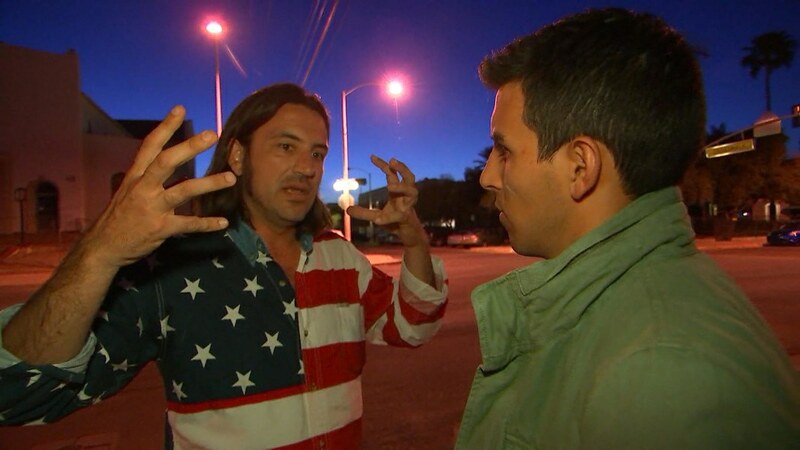 We gotta take our country back, very simple." The Trump campaign did not immediately respond to a request for comment about the Sanders incident. Video of the clash also shows a person in a white hood, following behind, delivering what appeared to be a Nazi salute. 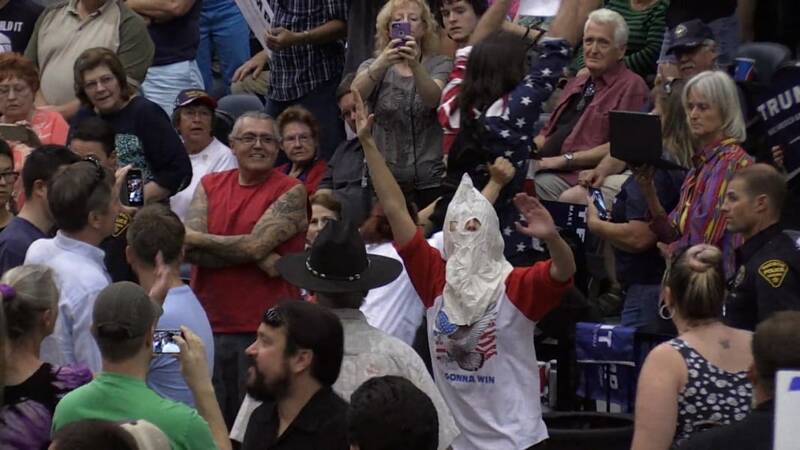 "There's a disgusting guy, puts a Ku Klux Klan hat on," Trump said. "He thinks he's cute. He's a disgusting guy." Later, he referred to the person again. "These are bad people, I'm telling you. And they're not really protesters. They're agitators." Critics have accused Trump's rhetoric of encouraging violence. Trump has said he does not condone violence. The candidate on Saturday did acknowledge controversy about violence at his rallies, saying "we don't have problems" and "the little problems we have are very minor, nobody gets hurt." Sanders, who said he is an independent and plans to vote for Bernie Sanders in Tuesday's primary, said he expected the crowd might be hostile but was surprised by the violence. 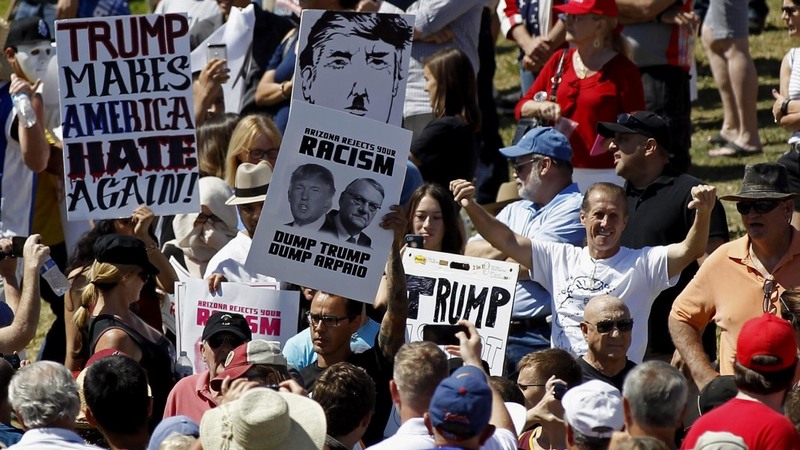 "I understand that people support Donald Trump, but do they support this kind of scene?" he said. "Really?" "Let's relax, not beat each other at rallies, ok? Even if we have dissenting opinions... I find it un-American that each of us can't dissent."